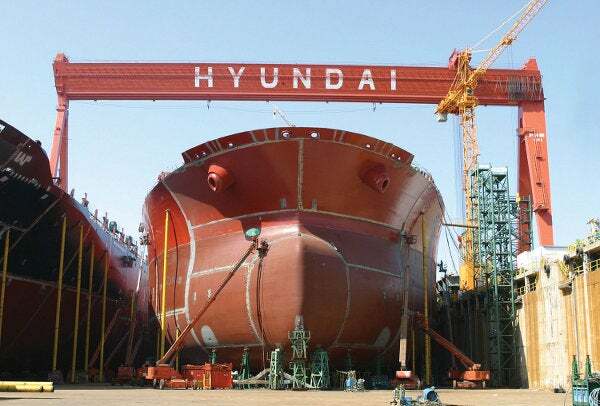 Hyundai Heavy Industries (HHI) is expecting its order growth to drop by 20% in 2012, amounting to less than half the orders it secured in 2011, due to the effect of the global downturn on maritime trade. The South Korean shipbuilder is targeting $30.6bn worth of orders and sales of KRW27.6tn ($23.85bn) in 2012. The 2012 annual order and sales targets are expected to increase 19.6% and 9.5% respectively over its results in 2011, which saw a 48% increase in year-on-year orders to $25.5bn and KRW25.2tn ($21.6bn) in sales. In November 2011, the company reported a 29.97% drop in profit to KRW432.8bn ($387.5m) during Q3 2011, compared with the KRW618bn ($553m) it reported during Q3 2010. The company said the dip in profit was mainly due to the decline of its offshore business; however, its revenue increased 11.28% to KRW5.9tn ($5.2bn) compared with the KRW 5.3bn it reported during the corresponding quarter in 2010. The South Korean shipbuilder won $22bn of new orders during the first nine months of 2011, led by orders for high-end ships such as drillships and LNG carriers reporting a year-on-year rise of 58%, reaching 83% of its annual target of $26.6bn. The company’s shipbuilding division won orders worth $10bn, its offshore division won $3.3bn and its engine and machinery division $2.8bn, reporting a rise of 226%, 22% and 51% year-on-year respectively. The company has seven business divisions and is now focusing on offshore facilities such as drillships to increase its order target to $5.2bn this year, up from the $4.8bn in 2011. According to reports, HHI is currently bidding for some major projects, including building a floating production storage and offloading vessel worth $3.5bn in Nigeria. Shipbuilders, including HHI, are trying to diversify their businesses as demand for commercial ships, such as container carriers and bulk carriers, is sluggish. Caption: HHI is aiming for $30.6bn in orders and sales of KRW27.6tn ($23.85bn) in 2012.